X Peanuts Snap Case for iPhone X is an leather case for the iPhone X. 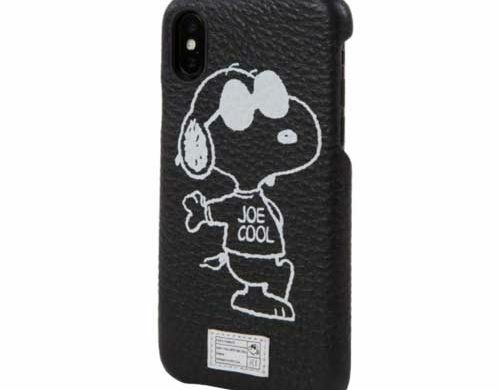 It comes in black and has a picture of Snoopy of Peanuts fame wearing a shirt saying Joe Cool. It also has a white stitched label on the bottom. 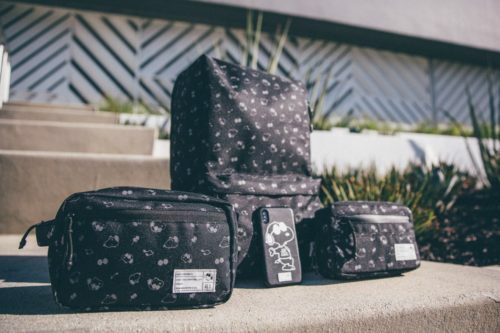 The case is part of a Peanuts collection that includes a Backpack, Waist Pack and a Dopp kit. Hex has other collections including Star-Wars and Coca-Cola on their website. 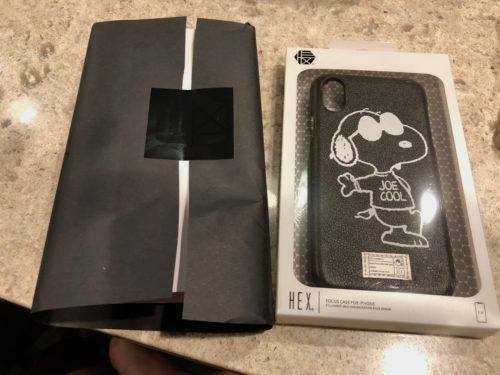 Packaging for the X Peanuts Snap Case for iPhone X is excellent. It comes with a nice thank you card from Hex. The case feels very sturdy and appears to protect the iPhone well. The smell of quality leather is there and feels like it. 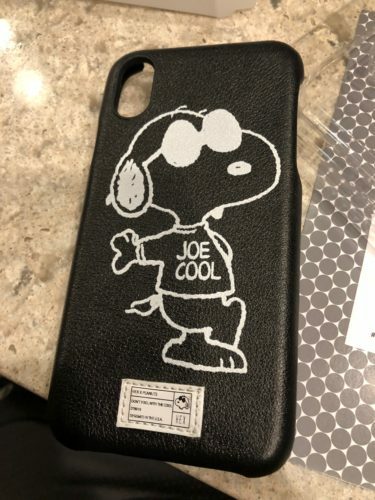 Snoopy looks great in his Joe Cool shirt on the back. It’s a very attractive case. No problems putting the case on and off. However, not everything is perfect with this product. The white stitched label is a problem. I tried to accept it, but I couldn’t. First of all, it doesn’t look good on the case. The label takes the ascetics of the nice black leather with the white Snoopy away by calling attention to it. More importantly, it doesn’t feel good when holding. It’s an elevated label with stitching that annoys my hand when I hold my phone. The case is perfectly smooth otherwise. I don’t know the reason why Hex put this non-removable label on the case. Maybe it’s because of licensing. Maybe they thought it would add authenticity to it. Whatever the reason, they really should have either put the label inside the case or made it removable. MyMac Review Rating is 6 out of 10. A nice iPhone case that would score better without the stitched label.